England may have let West Indies escape from the first Test in Antigua with a draw, but they did not do a lot wrong on the final day. I always felt trying to winkle out eight wickets on a lifeless pitch would be a tough ask, and so it proved, notwithstanding some crazy shots from the West Indies batsmen. When Jermaine Blackwood got out to one of the worst shots I have ever seen in Test cricket - running down the pitch to Chris Jordan - to leave England needing just four more wickets with 50 overs to go, victory for the tourists looked inevitable. England will be disappointed they did not get over the line from that position, but there was not much fault to be found in their bowling. They just came up against one of the rising stars of world cricket in Jason Holder. Bearing in mind that his previous highest score in first-class cricket was 52, for Holder to score a hundred in those circumstances was simply brilliant. We watched him display a maturity beyond his years when he captained West Indies in the World Cup, and the character he showed in saving the game today leaves me in no doubt that this young man will go on to achieve big things in future. 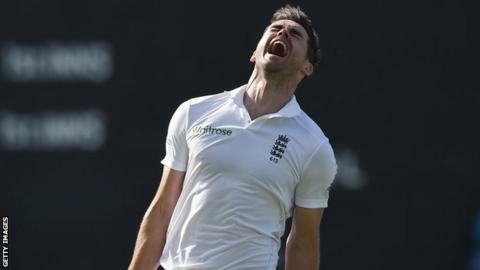 Of course from an England perspective, the day belonged to a man at the opposite end of his Test career - James Anderson. To surpass Ian Botham as England's all-time leading wicket-taker is an enormous achievement by Anderson. It is testimony to years of leading England's attack tirelessly, and to his willingness to learn new skills. It is easy as a bowler to do the first thing you can do and be happy with that, but Anderson has taken the art of swing bowling - particularly reverse-swing bowling - into new territory. As a former swing bowler myself, I have sat there and watched him in amazement. What makes Anderson so special is his ability to swing a brand new cricket ball both ways. As a swing bowler you generally only have one way of swinging a brand new ball - in my case it was the outswinger. But Anderson makes swinging it both ways look easy. I am not sure even he realises what an incredible talent that is. My mind goes back to the young man with the red stripe in his hair making his debut in 2002, and it is incredible to think how far he has come since then. It was fitting that Alastair Cook took the catch - those two are good mates and they have been through a lot together. "England missed a trick by not playing Adil Rashid in this match. The leg-spinner could have been a real threat on the fifth day. But in terms of tactics, England were excellent all day. They just didn't have enough variation in the attack." It was a good catch by Cook, who I thought had a fine game as captain. People will say he should have declared earlier, but I think all that hindsight criticism is a bit silly. England gave themselves half an hour before tea on the fourth day - that is enough time to bowl a team out. If they were going to win this match, they would have won it before the final over. One thing Cook and England will have to consider is the make-up of the team for the second Test in Grenada. The attack perhaps did not have the variety it needed to take 20 wickets, so I would consider playing leg-spinner Adil Rashid instead of Jordan. I think James Tredwell's lack of penetration on the final day will count against him and they will bring in Moeen Ali, and they have to consider whether to persevere with Jonathan Trott at the top of the order or bring in Adam Lyth. England will know they were the better side in Antigua, but they have still got two Test matches to go. They just have to look at the areas that will make them better. Listen again to BBC Radio 5 live's Jimmy Anderson: The Wicket Man via BBC iPlayer or the 5 live podcast special.